A year ago today I opened a yoga studio for kids in Southlake, Texas. When I graduated from yoga teacher training I never in a million years saw myself owning a yoga studio. In fact, I never thought I would teach publicly. Which is why today is even more of a surprise. A couple of weeks ago my right-hand-woman and genius in charge of details and all things reporting at the studio and I were sitting at her desk when she showed me the year end numbers. I didn’t realize how many thousands of kids had been in the studio. Thousands. Whoa. There have been ups and downs and in betweens. Days I’ve felt on top of the world, and days I questioned why on earth I would disrupt my peaceful life with the headaches that come with running an open to the public business. I have four kids, after all, surely that was enough to fill my life with happiness and stress. Last week while trying not to die at the hands of the flu, I came to a couple of realizations about myself. (Nothing like Nyquil induced delirium to really do some introspection.) And I realized that I am ambitious, sometimes overly so. I just can’t help it. I was babysitting kids at the age of ten and worked all through high school, and was on super-drive after high school and chose work over learning how to play beer pong. Ambition is in my blood. I want to do things, accomplish things, make a difference. I think most of us do. Sensitivity is also in my blood. My lip quivered as a kid and I would cry at every scene that felt sad or seemed unfair, tears flowing as easily as my breath. And I often felt unheard and misunderstood. So now it seems so logical to me that I would want to create a space that gives kids an hour to feel how they feel in their bodies, in their minds, and to be in a class that invites individuality and…tears, without judgement or the need to be validated. I created something I craved as a kid. It was my dharma, as my teacher once told me after she handed me my teacher certification. Creating this space for kids to be themselves and learn physical, emotional and energetic tools to fully embody who they are and understand themselves is an important part of my life purpose. I get it now. And maybe that’s what we are here to do. To take a look at what we so desperately craved as a kid, or what really bothered us when we were younger, and instead of looking at it as a defect or issue, looking at it as a call, an invitation, and accepting it, and then seeing what inspiration comes from the acceptance, and what action we feel called to take. It’s that action that makes a difference. Because we all have the best ideas rolling around in our brains, but if we never share them or take a chance and see how they look in the real world, we remain selfish with our creativity. 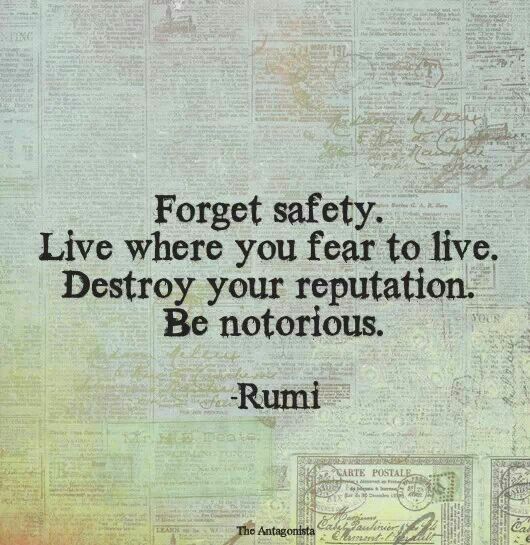 Let’s be notorious, shall we? PS Do you know someone who has great ideas but doesn’t share them? Forward this to them, it could just be the inspiration they need to take a risk.